We’ve seen bands use video games as a platform to debut songs and videos before (Mìtley Crüe’s single “Saints of Los Angeles” in Rock Band, for example), but now Nintendo is adding a stereoscopic take to a music promo. Starting now and running through April 16, the only place to see the new video for the Shins’ “The Rifle’s Spiral” is via a download to your Nintendo 3DS handheld. The clip is viewable in both 2D and 3D, via the Nintendo’s 3DS Video app (in fact, if you have the video app already installed, the Shins video will automatically download itself the next time you open it). The video was directed by Emmy-winning animator Jamie Caliri, who has directed music videos and done animation for films and TV shows such as Lemony Snicket’s A Series of Unfortunate Events and United States of Tara. 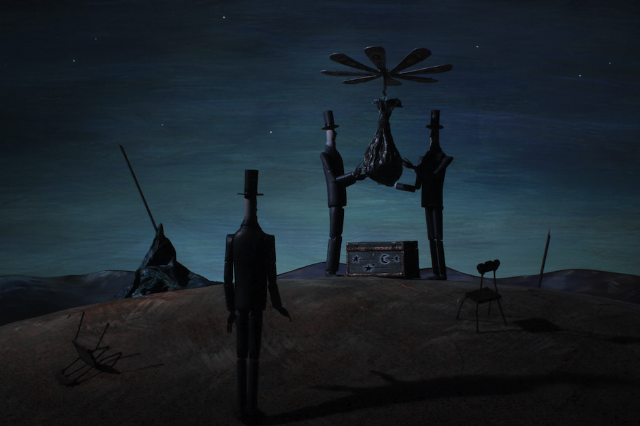 The clip for “The Rifle’s Spiral” is a spooky looking stop-motion animation, with what looks to be a trio of evil magicians chasing a young girl. Visually, it’s got a very Tim Burton vibe, and the 3D effects work especially well with stop-motion animation, allowing for shifting fields of focus and sharply angular characters and sets that pop right out at the viewer. While the amount of 3D video available for the Nintendo 3DS is still small, it’s nice to see this unique handheld 3D gadget get some exclusive content, and we hope to see more of this kind of thing in the future.